I am not a fan of movies that include torture scenes and there's no shortage of it in Prisoners. This movie is definitely not for the squeamish as it tears at your heart with powerful scenes. The movie is a display of raw emotions when two children are abducted, as a parent will be pushed over the limit as to what is acceptable by society in order to get his child back. Hugh Jackman plays Keller Dover, father of one of the abducted children. Terrence Howard plays Franklin, his neighbor, father to the other child. During the abduction, Keller's teenage son, played by Dylan Minnette recalls a suspicious RV in their neighborhood just prior to the children going missing. 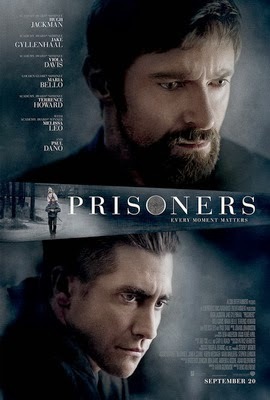 When the police led by Detective Loki (Jake Gyllenhaal) arrests the driver, Alex Jones (Paul Dano), he is found to be innocent due to lack of evidence and free a day later. Due to a series of circumstances, Keller is unconvinced of Alex's innocence, despite Alex having an IQ of a ten year old. When Keller abducts Alex to force information out of him, that's when the story starts to take off. The story has several complicated pieces that if you catch on to the visual cues will help you unlock the whodunit mystery midway through. The subplots of Detective Loki's side investigation are important as they all wrapped up quite well in the end as to who is related to whom, and who each person actually is. The story doesn't over complicates itself with a huge number of suspects which really helps understanding and figuring it out. It also helps having a great cast lead by Hugh Jackman and Jake Gyllenhaal. The stand out for me however is Melissa Leo who plays Alex's aunt. Overall, I would recommend this film to those that are not squeamish. It is far too violent for children to watch, so please do not have them watch with you! The film is already in theaters as of this past Friday, go catch it this week and let me know what you think.